World champion Lewis Hamilton says the return of female models to the F1 grid at this weekend’s Monaco Grand Prix is “a beautiful thing”. The sport’s owner Liberty Media stopped the use of ‘grid girls’ in January, saying their use was “at odds with modern day societal norms”. Models for Swiss watchmaker Tag Heuer will feature on the grid at Monaco – though not in ‘grid girl’ roles. “Women are the most beautiful thing in the world,” Hamilton, 33, said. Traditionally, grid girls would hold driver placards on the grid but the Monaco models – who will include men – will only be there as representatives of Tag Heuer, taking pictures of the drivers to be posted on social media. Last month, Monaco organisers spoke of their opposition to Liberty’s ban. Ferrari driver Sebastian Vettel said he “agreed with Lewis”. “I like women. I think they look beautiful. The bottom line is that there is too much of a fuss nowadays,” the German said. The decision to drop grid girls proved controversial. Supporters of Liberty’s stance agreed that the practice objectified women. “I definitely don’t think we should ever be supporting or pushing these women in general to feel uncomfortable. And if they are, then we shouldn’t do it,” Hamilton added on Wednesday. 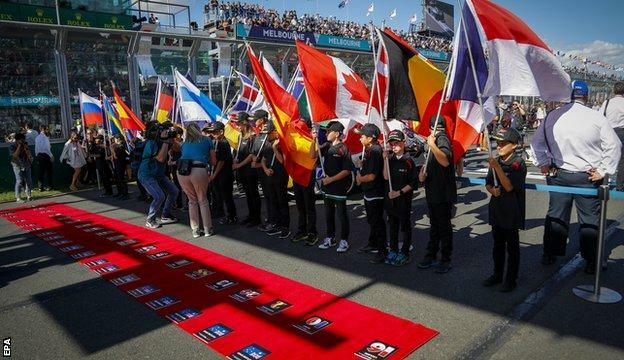 Boxer Stacey Copeland told BBC Sport that the use of grid girls in F1 is ‘unnecessary’. “The sexual objectification of women in sport is not necessary,” she said. “It doesn’t add anything and enough is enough. “Change is always really tough and will have its ups and downs but just because we’ve always done something does not mean it should carry on. But critics claimed the models were part of sport’s glamour, while others blamed political correctness and some of those carrying out the roles were equally vocal about the ban.